My latest project is updating a 1948 master bathroom. It’s tiny. Just a pedestal sink, toilet and a small (ancient) glass shower. High gloss black and mustard tile is EVERYWHERE and needs to be replaced. My first order of business is to pick new floor, wall and shower tiles. I thought I had narrowed down the “look” until I went tile shopping. There is so much to choose from and all of it is gorgeous. Big problem. Updated mustard and black tiles. Ha, ha! My original idea of a beveled white subway tile and a fun marble design for the bathroom floor and shower all of a sudden seemed BORING. Gray and white, a favorite. Ugh, I am in trouble. I will keep you posted as to what I choose! Sources: Artistic Tile, Walker Zanger, Home Depot and Missy. Love this! Favorite post so far! If small keep it simple tho I love my river rock shower floor. A massage every day! Shea is going to have a few chick words from you when he comes home and I tell him i want a new bathroom floor!! The tile on your cover, please! I love that one too… Rut row. Hi, where is the very first tile from? I have been looking for something like that. Thanks! 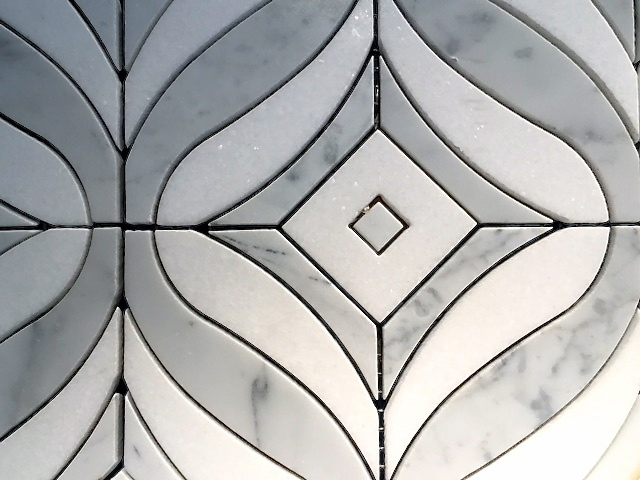 The first tile is from Walker Zanger. Good luck!